And finally we come to the last stage of our South American jaunt, two nights in Rio de Janeiro. I’m sure when you think of Rio, you think of sun drenched beaches, beautiful people in skimpy swimming costumes, carnival extravaganzas, and all that kind of thing. Well we were in Rio for what was apparently the last two days of winter; and although you can have winter sunshine, it isn’t guaranteed! We were lucky for our first afternoon but the last two days were overcast, misty and a bit drab. Nevertheless I had reserved my jolliest sunniest shirts for these days in Rio and I wasn’t going to be deterred from wearing them. Our hotel was the Porto Bay and it looks a little like an office block from outside; actually it feels a little like an office block on the inside too. The rooms are functional rather than exquisite; but the rooftop swimming pool and bar has a wonderful view over Copacabana beach, even though we had to experience a Force 10 Gale to witness it. The dining room also overlooked the sea and our balcony did have a side view of the beach, which did feel rather special. Our travel guide was a very hearty lady who hated Argentineans. It was because of the football, she said. 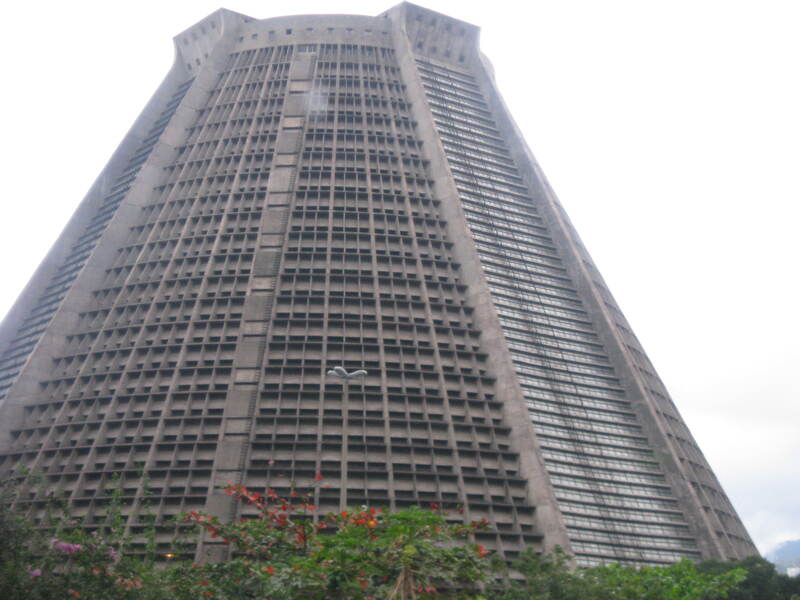 The Argentineans hate the Brazilians equally, she opined in self-justification. I’m not sure if she was expecting a barrage of post-Falklands War approval of this stance from a busload of Brits, but Mrs Chrisparkle and I looked on in slightly disturbed bemusement. Regrettably I can’t remember her name, but she was also very concerned for our safety on the big bad streets of Rio. Once we had all checked in to our hotel rooms, she insisted on walking us round the block – which took maybe all of ten minutes – showing us which shops were safe to use, where you could change money, where it was safe to eat, where it was safe to cross the road…. If we weren’t worried about crime beforehand we certainly were afterwards! 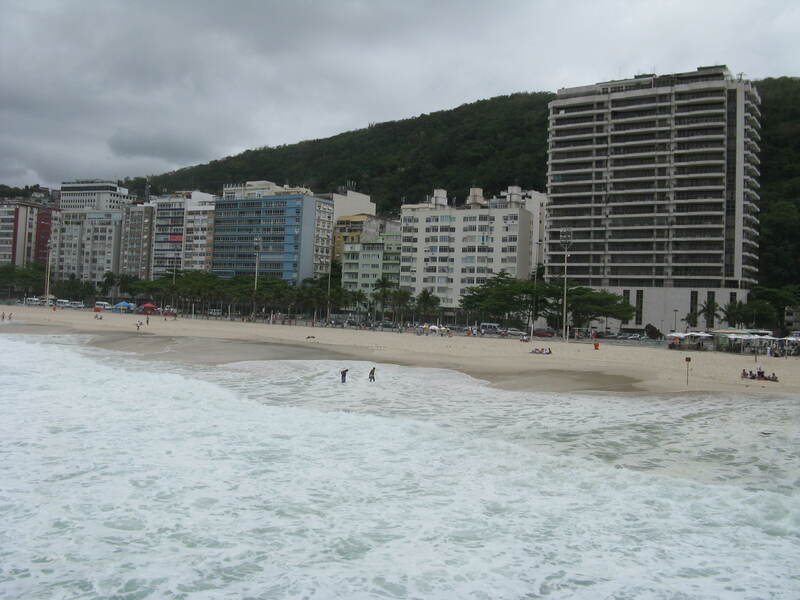 So what else could we do having arrived in Rio on our first afternoon – where there were indeed some rays of sun – but have a wander on Copacabana beach. It was a bit of a challenge to get something gluten-free for lunch, so we ended up with a couple of plates of chips and a glass of wine adjacent to the sand. It was slightly bizarre to be having chips, and the wine was frankly disgusting, but the whole experience was strangely lovely. Cheerful beach sellers peddled their souvenir wares; for the most part a happy “no” sent them away merrily. People were drinking – a non-alcoholic drink apparently – out of hollowed out coconuts. It all looked very exotic. We thought we’d go for a walk on the beach. Dear reader, this world is divided into two types of people: people who naturally look great on beaches, and people who don’t. Regrettably, Mrs C and I fall into the latter category. We kicked off our shoes, still wearing shirts and jeans, and picked our way past all the bronzed beauties wearing costumes barely wider than a shoelace. We couldn’t have stuck out more if Mother Teresa were playing beach volleyball with us. 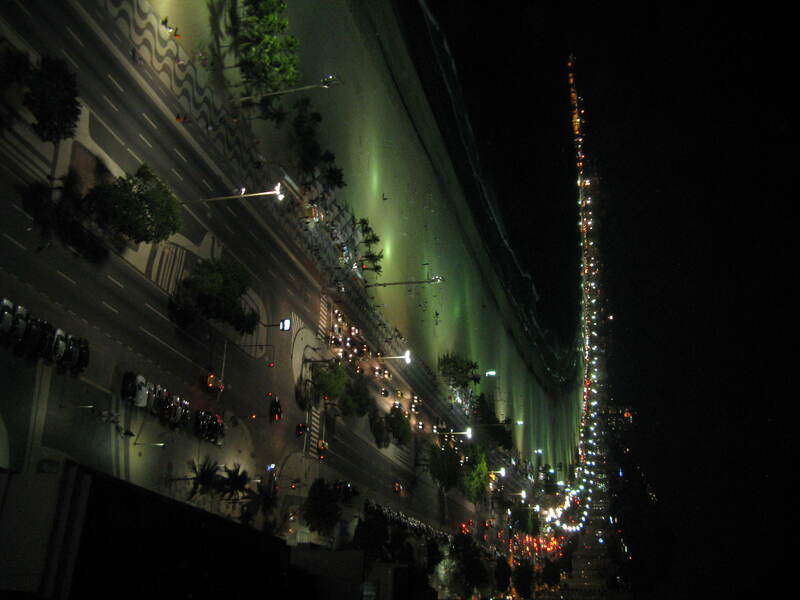 Nevertheless, walking on Copacabana beach is Something You Have To Do, it’s very comfy sand, and it was fun. We met up with some of our fellow intrepid co-travellers for pre-dinner drinkies at the posh hotel next door, the Copacabana Palace. 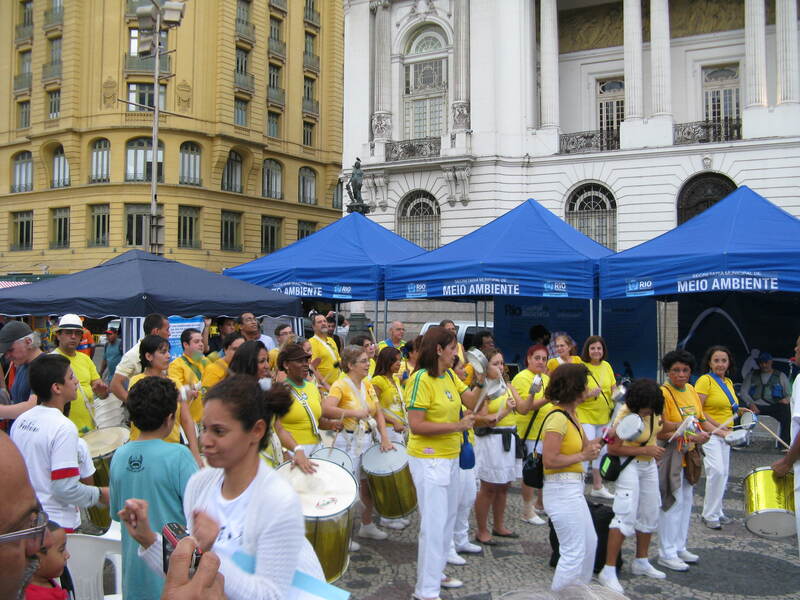 The “Rock in Rio” festival was taking place at the time, and many of the performers were staying at the hotel. I think Elton John was there. He didn’t go down for drinkies though, which is a shame, because I think he’d have liked it. We did; it was all very elegant and pampering, and you felt privileged and refined simply by being there. For dinner we decided to try the rather brusquely named “Arab” which has a good reputation for its Middle Eastern and Indian food. It’s certainly true that the food was delicious – but we had no idea what we were eating as nothing that we ordered from the menu appeared to arrive on our plates. 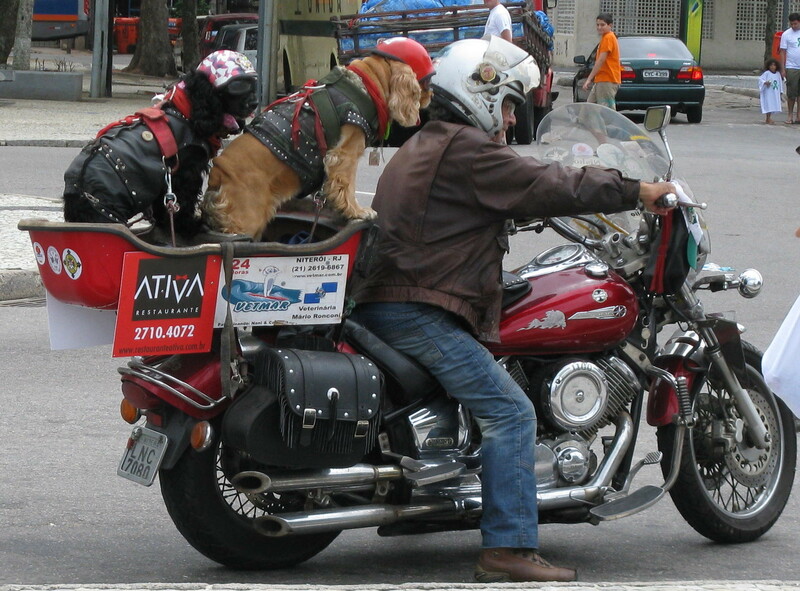 Talk about confusing! When you look at the food you’re offered, and then you check with the description on the menu, and nothing seems to tally, you wonder if you’re mad or they are. It’s also hell for a coeliac, so rather than risk a nasty attack I think Mrs C pretended she wasn’t hungry and survived the whole evening on some plain rice and a plum. And it took for ages to come. And they got the wine wrong; in fact absolutely everything about it was a disaster apart from the actual taste of the food, which was great. Most bizarre. The waiter laughed about it afterwards. Lucky to have such a developed sense of humour. Next day was our Grand Tour of Rio. In the mist. 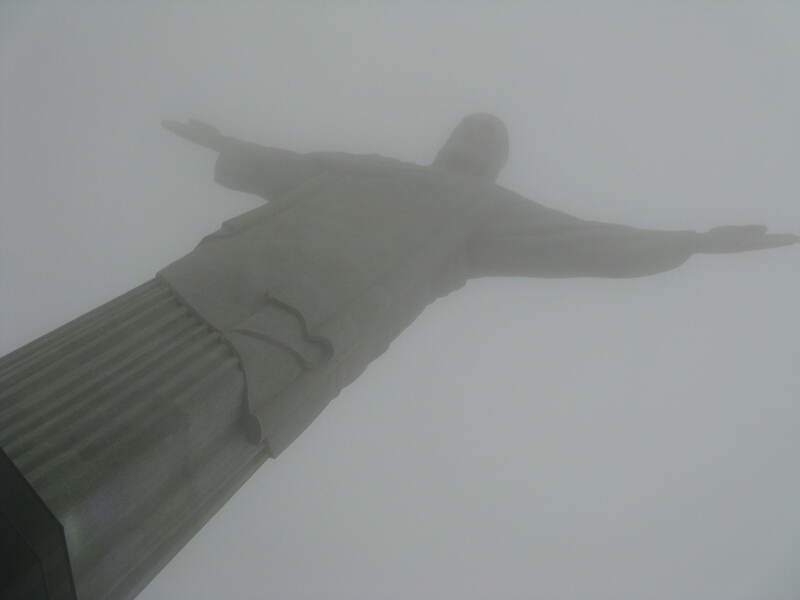 It didn’t occur to me that going all the way up Corcovado to see the statue of Christ the Redeemer and its stunning views over the city isn’t going to have quite the same effect when you can barely see three feet in front of your face. The train ride up is full of hope and expectation – mutterings like “it will clear” and “it’ll still be exciting” and “well we’ve been very lucky with the weather so far” abound – but actually at the top it was cold and bleak. There were still hundreds of people up there all jostling for the best photo position. Instead of concentrating on the stunning view, you look up and feel very dominated by the statue of Christ, which takes on a rather eerie nature as it looms up out at you from the grey. I expect in the sunshine it’s quite a reassuring sight. In the mist it felt a bit scary. Our chummy guide reminded us that the weather was going to deteriorate later on, so she wanted us to press on and go up the Sugar Loaf Mountain “whilst there was still some point in doing so”. 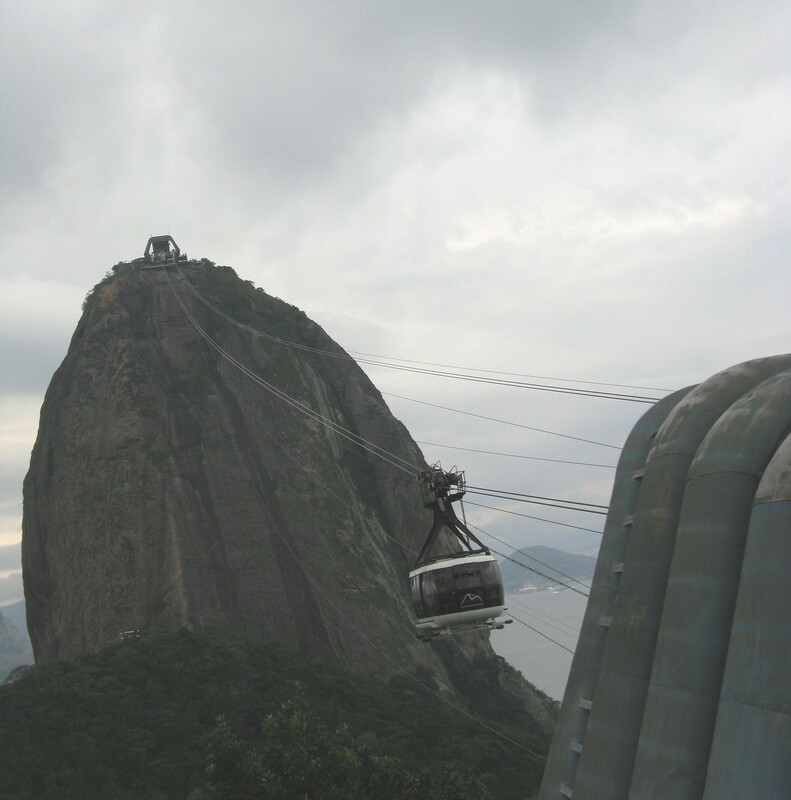 You ascend the Sugar Loaf by cable car and jolly exciting it is too. Actually, the weather wasn’t so bad at this point and we got good views all around. There is one particular viewpoint where you can pose with your loved one and Rio unfolds behind you in a most picturesque way. There was quite a queue for this vantage point, but, undaunted, our guide hustled and bustled her way to the front of the ledge. With one hand she refused entrance to other lesser tourists and with the other she took Pulitzer Prize winning portraits of her group. Borderline aggressive she may have been, but she sure had her uses. There’s not a lot up there on top of the Sugar Loaf to be fair; it’s mainly to say that you’ve seen it, and the views are magnificent. After about twenty minutes or so you’re happy to re-descend and go for lunch. Lunch was at a magnificent place, the restaurant A Mineira. I realise now that it is one of a chain so I can’t say which branch it was that we visited, but it’s an extensive authentic buffet, absolutely full of delicious food, and you pay one price to eat as much as you like. It was absolutely gorgeous – we’d really recommend it. Our guide firmly told us we had to try as many different types of unusual food that we could find; so I was only obeying orders. Our next stop after lunch was the cathedral. It’s a very modern affair, and rather put me in mind of the Metropolitan Cathedral in Liverpool. It’s an interesting shape, like a huge wigwam. The stained glass windows are astonishing; vivid and huge, soaring up the sides to heaven itself. 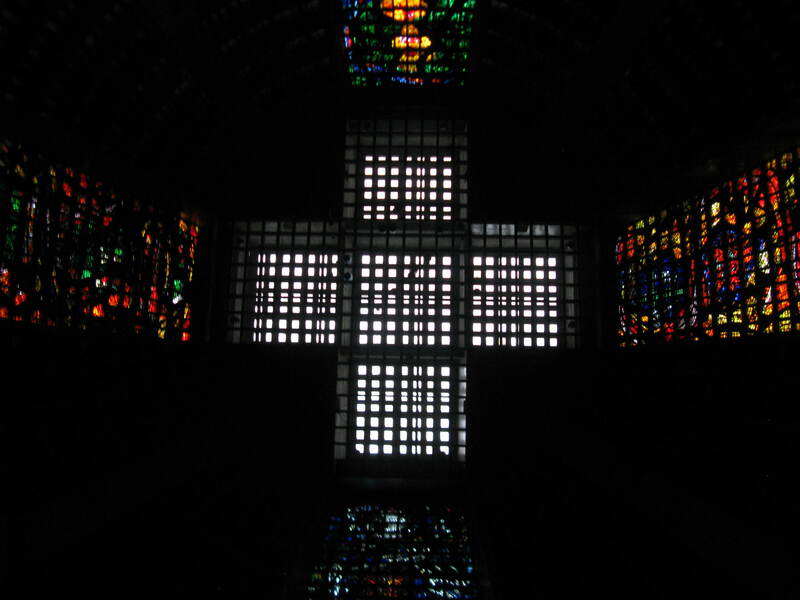 From inside, you look up to the centre of the ceiling to see a large stained glass cross, a most effective use of the medium. The bell tower outside looks rather weird – a little like one of those emergency staircases at a firestation. Well worth a visit. 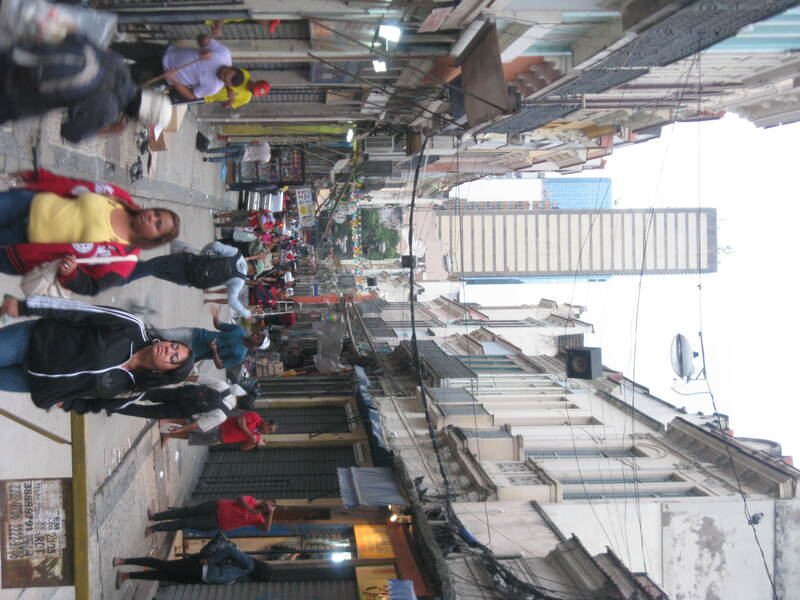 Not far from there is the Theatro Municipal, adjacent to a nice little square where some kids were learning samba. Very jolly, it offered a nice photo opportunity. The final sight we were taken to was the Escadaria Seleron. 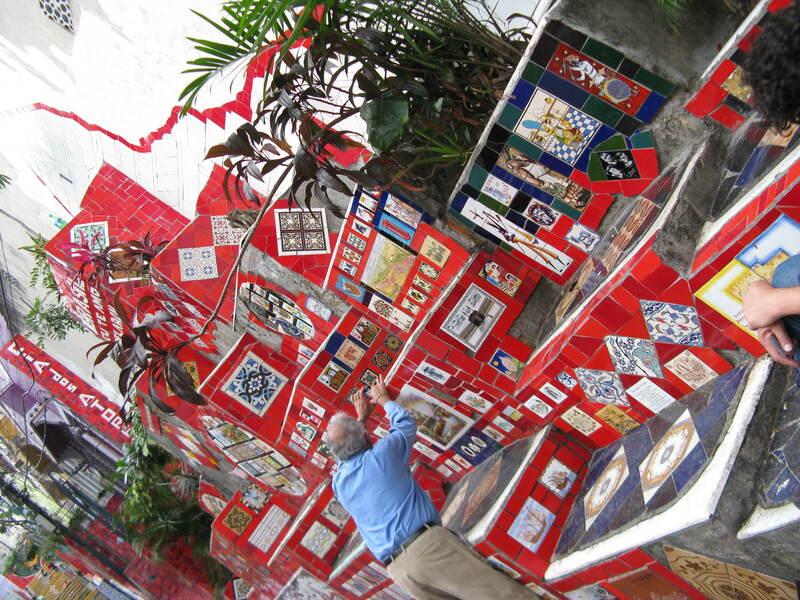 This is a big set of stairs that the artist Jorge Seleron has decorated with colourful tiles from around the world. It’s a burst of vibrancy in an otherwise dull neighbourhood, and it’s fun to inspect the tiles and see if you can find any from places you’ve been to. You can clamber all over them too. It’s an unexpectedly bizarre source of cheerfulness and pizzazz that attracts lots of visitors. A cautionary tale though: one of our intrepid co-travellers was photographing the staircase when a passer-by tried to steal her camera by simply pulling it from her hand whilst she was taking the picture. Fortunately she had the cord wrapped around her wrist, so they didn’t get away with it. Hurt her wrist though, I think. We found a very nice place for a drink round the corner of the hotel – an authentic wine bar type place called La Fiducia. It’s obviously an annexe of the pricey looking restaurant on the other side of the road. It looked quite expensive but very smart; and according to the wine list they had wines at all prices so I thought we’d try a bottle of something mid-priced. 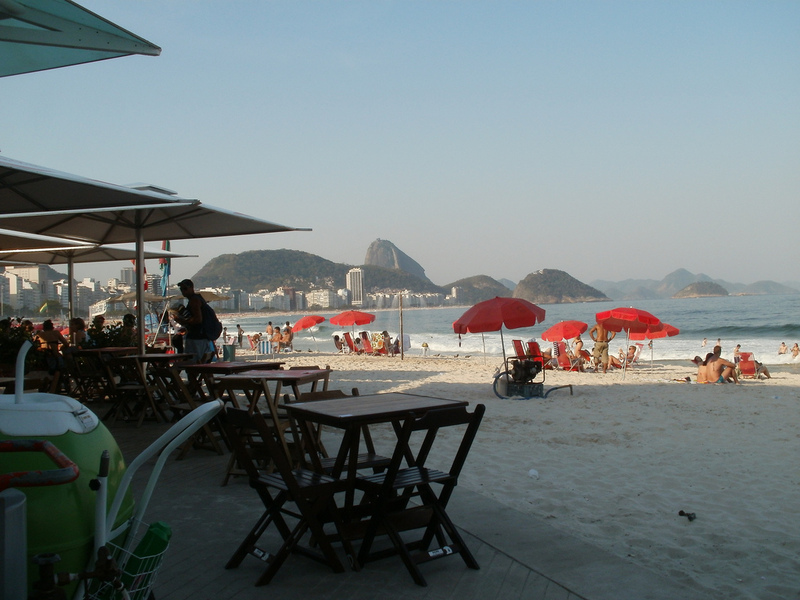 They didn’t have it – in fact we had quickly realised that nowhere in Rio has half of what they put on their menus. But they suggested an alternative similar bottle, whisking the wine list away from under my nose as they went off to get it. They brought it to the table. Fortunately, before I they started opening it, I recognised its name from the wine list as being one of their most expensive wines (something like £70 a bottle). NO NO!! I shrieked, that’s ridiculously expensive! There was a distinct look of disappointment on the waiter’s face as he realised he’d been outwitted. I chose again and managed to get away with a (relatively) cheap bottle at about £30. Phew. That was close to an International Rip Off Incident that could have had Unfortunate Consequences. For dinner we thought we’d try one of the places further along Copacabana beach and after a few false starts, found a little gem called Deck. The food, drink and atmosphere were all great. They also spoke English well, a surprisingly rare commodity in Rio. It was just what we needed – so much so that we decided to go back there for lunch the following day. It’s not sophisticated; just seasidey and welcoming. 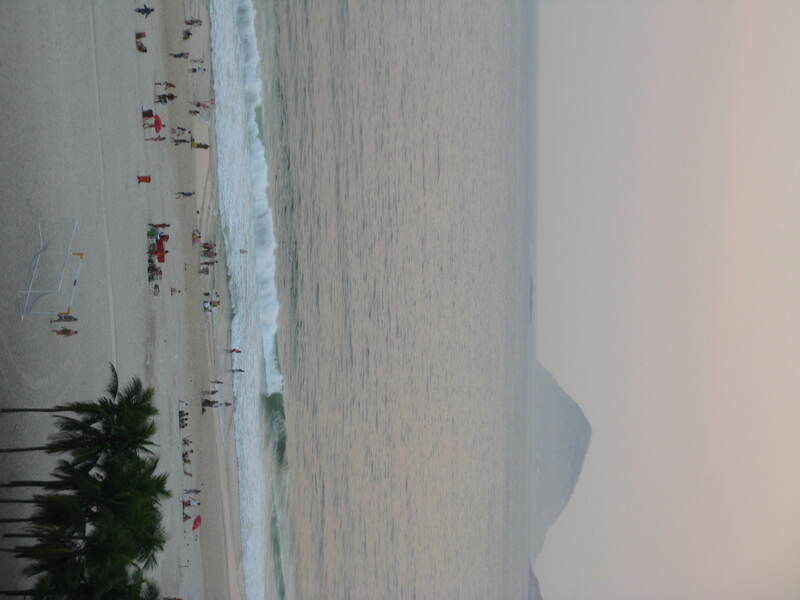 That takes us to our last day in Rio – and indeed in South America – which was a Sunday. 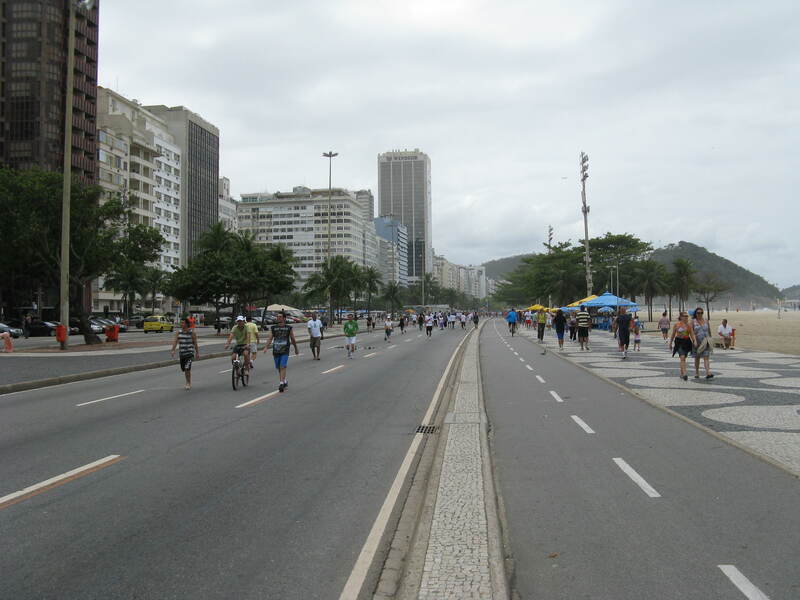 From Monday to Saturday the main road that separates Copacabana beach from the hotels and restaurants on the other side of the road is a maniacally overcrowded thoroughfare, requiring adept powers of traffic prediction and heaps of good luck to get across safely. On Sundays, they change the city’s traffic flow so that this road is pedestrianised. And what a welcome sight it makes! Joggers, pushchairs, dog walkers and even tourists all have a day of safety and free movement. We walked to the north end of the beach and around the little headland that offered a great view back on to Copacabana. 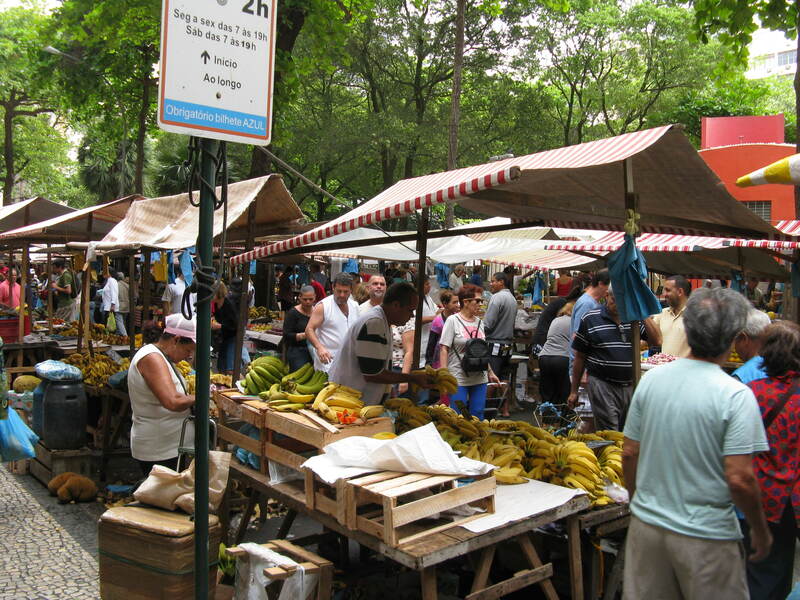 On our way back to Deck for lunch, we stumbled upon a local market, selling all sorts of day to day stuff for locals – food, kitchenware, haberdashery, even goldfish in little plastic bags like you used to see at the funfair. Our trip back to Deck didn’t disappoint, and we sauntered back to the hotel to await our transfer coach, sad to leave Rio and South America behind, but satisfied in the knowledge we’d had an excellent trip. 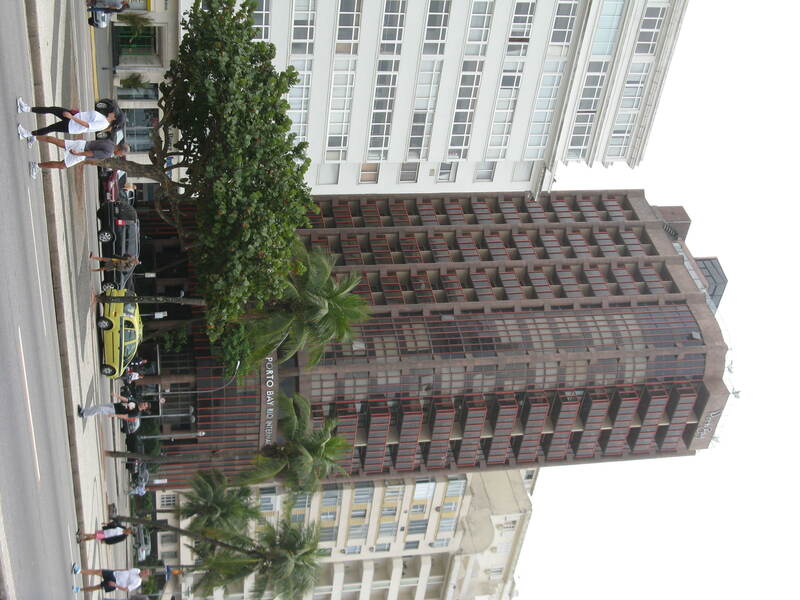 This entry was posted in Travel and tagged A Mineira, Arab, Brazil, Copacabana Palace, Deck, La Fiducia, Porto Bay, Rio, Rio de Janeiro. Bookmark the permalink.